Matt den Dekker had been advertised as the top defensive outfielder in University of Florida history. During the occasions when the Mets borrowed the 2010 fifth-round pick from minor league camp for Grapefruit League games, den Dekker offered glimpses of why he received that billing. In fact, a March 19 diving catch in right-center as he converged on a ball with Daniel Murphy and fellow minor leaguer Lorenzo Scott landed den Dekker on SportsCenter’s top plays highlight reel. Matt den Dekker had three highlight-reel catches despite limited action in Grapefruit League play, by Josh Thole's count. Den Dekker had been drafted in the 16th round by the Pittsburgh Pirates after a disappointing junior season at the plate in 2009 (.257 in Southeastern Conference play). He returned to the University of Florida for his senior year and helped lead the Gators to their first College World Series appearance since 2005. “I’ve seen him make three spectacular catches,” Josh Thole added about lefty-hitting, lefty-throwing den Dekker. The 23-year-old Den Dekker -- who opens the 2011 season in center field on Thursday with Class A St. Lucie -- hit .346 with no homers, 15 RBIs and three steals in 104 at-bats with low-A Savannah last season after the draft, although he did strike out 28 times and hit .250 against left-handed pitching. While appearing in eight Grapefruit League games, he went 3-for-8 with a homer and four RBIs. The long ball, a three-run shot, came off St. Louis Cardinals right-hander Mitchell Boggs in the sixth inning of a March 24 game. He also had a stellar catch that day -- over-the-shoulder while retreating toward the center field wall to take away an eighth-inning hit. “I enjoy that. It’s fun being out there running balls down, helping out the pitcher and doing my part out there,” said den Dekker, whose first Grapefruit League hit came March 1 against Washington’s Drew Storen. As Wilson noted, den Dekker needs to make strides offensively. Still, Binghamton manager Wally Backman was so enamored by him, the Double-A skipper would have gladly taken den Dekker had team executives wanted to push the prospect. Average: Darrell Ceciliani, Brooklyn, .351; Joe Bonfe, Brooklyn, .326; Josh Satin, Binghamton, .311; J.B. Brown, Brooklyn, .308; Cory Vaughn, Brooklyn, .307; Eric Campbell, Binghamton, .306; Lucas Duda, Buffalo, .304; Nick Evans, Buffalo, .300; Sean Ratliff, Binghamton, .298; Rylan Sandoval, Brooklyn, .295. Homers: Lucas Duda, Buffalo, 23; Nick Evans, Buffalo, 23; Brahiam Maldonado, Binghamton, 21; Sean Ratliff, Binghamton, 21; Zach Lutz, Buffalo, 19. RBIs: Lucas Duda, Buffalo, 87; Wilmer Flores, St. Lucie, 84; Sean Ratliff, Binghamton, 80; Nick Evans, Buffalo, 80; Kirk Nieuwenhuis, Buffalo, 77. Steals: Cesar Puello, Savannah, 45; Pedro Zapata, St. Lucie, 36; Juan Lagares, St. Lucie, 25; Darrell Ceciliani, Brooklyn, 21. ERA: Yohan Almonte, Brooklyn, 1.91; Angel Cuan, Brooklyn, 1.93; Jimmy Fuller, St. Lucie, 2.19; A.J. Pinera, Brooklyn, 2.44; Mark Cohoon, Binghamton, 2.57; Armando Rodriguez, Savannah, 3.08; Edioglis Villasmil, GCL Mets, 3.11; Pat Misch, Buffalo, 3.23; Collin McHugh, Savannah, 3.33; Wes Wrenn, Brooklyn, 3.36. Wins: Dillon Gee, Buffalo, 13; Mark Cohoon, Binghamton, 12; Jimmy Fuller, St. Lucie, 11; Pat Misch, Buffalo, 11; Josh Stinson, Buffalo, 11. Saves: Manuel Alvarez, Buffalo, 17; Michael Powers, St. Lucie, 15; Ryan Fraser, Brooklyn, 12; Roy Merritt, Binghamton, 9. Strikeouts: Dillon Gee, Buffalo, 165; Brandon Moore, Binghamton, 165; Armando Rodriguez, Savannah, 152; Jeurys Familia, St. Lucie, 137. 2009 top pick Steve Matz from Ward Melville High on Long Island, who underwent Tommy John surgery on May 18, 2010 and has yet to throw a professional pitch in a game, is starting to throw off the slope of a mound. He should be ready for a short-season team, which could mean Brooklyn or the Gulf Coast League. “He’s just throwing off the slope, and starting to get into that progression,” farm director Adam Wogan said. “He’s still on target to break with one of the short-season teams and get out and pitch a little bit this summer. We know next year is really the big year for him. This year is still more of a rehab year.” … Sean Ratliff, the outfield prospect struck in the face with a foul ball during a minor league spring training game, is being treated for a retinal tear in his right eye. He also suffered multiple facial fractures. ... Buffalo kicks off its season Thursday with Dillon Gee on the mound. The rotation also includes Jenrry Mejia, Boof Bonser, Pat Misch and left-hander Casey Fossum, the 33-year-old former Boston Red Sox pitcher who appeared in three games for the Mets in 2009, then went to Japan last year to pitch for the Hanshin Tigers. That depth pushes 23-year-old pitching prospect Josh Stinson to Double-A Binghamton’s rotation as Opening Day starter. Stinson went 2-2 with a 2.57 ERA in four late-season starts for Buffalo last year. “It’s about where the right place is for him,” Wogan said about Stinson’s assignment. “We feel like it’s good for him to go back there and get off to a good start. He had a few things we want him to work on. We do hope that he’ll be a guy who can pitch there [in Buffalo], or even in New York later in the year.” Wogan said one area of emphasis is fastball control. Stinson walked 50 in 110 1/3 innings with the B-Mets last season, although he improved his command later in the year and in spring training. … Joining Stinson in Binghamton’s rotation: Brad Holt, Robert Carson, Mark Cohoon and Brandon Moore. Holt, the 33rd overall pick in the 2008 draft, had a miserable regular season last year. He went 1-5 with a 10.20 ERA in 10 appearances (nine starts) with Binghamton, then was demoted to Class A St. Lucie. In the Florida State League, Holt went 2-9 with a 7.48 ERA. Between the two stops, Holt walked 79 and hit 17 batters in 95 innings. But the right-hander began to show improvement in the instructional league and then in the Arizona Fall League before being shut down with a bone chip/spur in his elbow. “He was able to shake off last year, chalk it up to something that’s in the past and try to move on,” Wogan said. … Infielder Luis Hernandez, who cleared waivers and agreed to stay with the organization rather than declare himself a free agent, will spend an extra week at the Mets’ complex in Florida getting into shape because he was behind at the beginning of spring training returning from a broken right foot. Hernandez then will join Buffalo and get the primary duty at second base, with limited action at shortstop, since Ruben Tejada is manning that position. That means Justin Turner, who was in the second-base competition during spring training with Brad Emaus, Luis Castillo and Daniel Murphy, will “be in the lineup as often as he can be and he’ll get some time at third,” according to Wogan. Of course, the priority at third base is prospect Zach Lutz, so Turner’s playing time should take a hit. But Lutz will have some days at first base and at DH, and also will get some time off, because the Mets don’t want to overtax him. Lutz has dealt with broken foot bones in the past. … Kirk Nieuwenhuis should get the majority of the starts in center field for the Bisons, but will see action at all three outfield positions. He needs to work on hitting left-handed pitching and facing curveballs. Buffalo’s deep outfield also includes Fernando Martinez, who primarily will see action in left field and right field. The Bisons also have former Twin Jason Pridie and Jesus Feliciano in the outfield, and likely Lucas Duda once Jason Bay returns from a rib-cage strain. Nick Evans will get exposed to the corner outfield spots, but he likely will see more action at first base. … Reese Havens, who underwent offseason surgery to remove an inch of a rib after being tormented by oblique issues last year, was unable to break camp with Binghamton and is not expected to join the Double-A team soon. Havens, the 22nd overall pick in the 2008 draft, is a gifted offensive player and potentially the Mets’ second baseman of the future, but he has been tormented by injuries throughout his professional career. Wogan describes the issue as tightness in Havens’ troublesome oblique/rib area, not an injury. “He’s just working himself back into baseball activity and rebuilding that core strength,” Wogan said. “… It’s probably by all accounts more just scar tissue and more the result of the surgery and needing to build back up strength there.” Josh Satin will handle second base with the B-Mets in Havens’ absence. Satin hit .308 with seven homers and 39 RBIs in 286 at-bats with Binghamton after a midseason promotion last year and had a strong Arizona Fall League. … Left-hander Eric Niesen will work exclusively as a reliever. He no longer uses the wind-up. 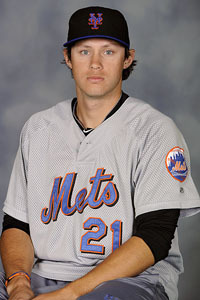 The Mets feel that will help with control, after Niesen walked 60 and hit 10 in 77 innings last season with the B-Mets. … With Savannah, Alonzo Harris will get exposed to left field in addition to his customary second base to take advantage of his speed. He may eventually get some action in center field too. Harris, 21, hit .224 with five homers, 42 RBIs and 18 steals last season with the Sand Gnats. … St. Lucie has several of the Mets top prospects, including 2010 first-round pick Matt Harvey, a right-hander from the University of North Carolina, as well as Wilmer Flores and den Dekker. Flores will remain at shortstop this season. … Catcher Dusty Ryan did not break camp with Buffalo because he was hit in the helmet by a pitch late in camp. He should join the Bisons about a week into the season. … Allan Dykstra, the former first-round pick acquired from the San Diego Padres for right-handed reliever Eddie Kunz in a change-of-scenery trade late in camp, will open as Binghamton’s first baseman. … The Mets released veteran first baseman Chris Shelton and left-hander Les Walrond. The Mets had a numbers crunch with players such as Evans, Misch and Hernandez clearing waivers. … Buffalo has three left-handers in its pen: Taylor Tankersley, Mike O’Connor and Justin Hampson. ... Jeurys Familia was named the 2011 Webster Award winner. According to the organanization, the annual award is presented "to a Mets minor league athlete who best exemplifies the integrity and character displayed by [Richard] Webster," who played Class A ball for the Mets in 1981 and '82.